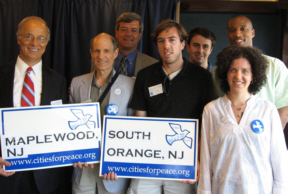 Maplewood Mayor Fred Profeta and Township Committee member Vic De Luca took part in Cities for Peace Day in Washington, DC on July 31, 2007 in which resolutions of 300 cities, counties and states calling for an end to the war in Iraq were delivered to Congress. 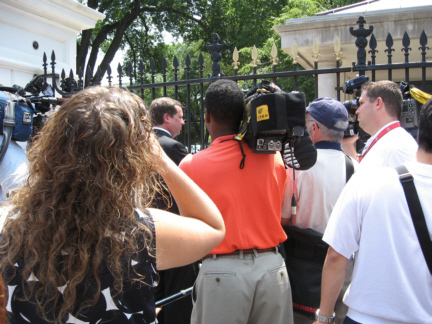 Following a press conference at the National Press Club local officials and constituents walked to the White House where Chicago City Council Alderman Joe Moore was rebuffed in his attempt to deliver the resolutions to President Bush. The group then walked to Capitol Hill where the resolutions were presented and local officials delivered testimony to members of the Progressive Caucus. [ for more photos continue reading below and then click Photos-1 and Photos-2 ]communications director for the Seton Hall College Democrats. Black carried a sign representing South Orange's peace proclamation of February 2007. 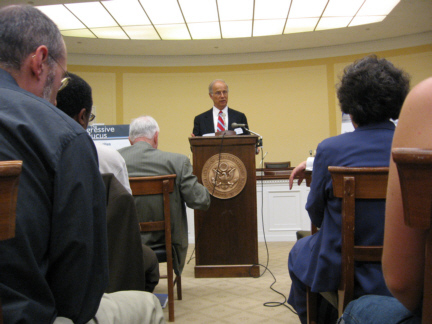 On Capitol Hill, Mayor Profeta joined Moore and local officials from Cambridge, MA, Chicago, West Palm Beach, FL, Ann Arbor MI, Bellingham WA, Boston MA, Cincinnati OH and other localities, who spoke of the impact of the war in Iraq on their towns and cities. 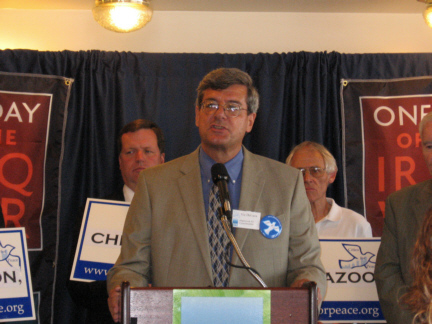 Profeta noted Maplewood's resolution of January 16, 2007 which urged "the Federal government to immediately commence a planned, orderly and rapid withdrawal from Iraq" and which proclaimed March 24, 2007 as Be About Peace Day in the township. Profeta contrasted the spending on the Iraq war with the Bush Administration's "default" on global warming. He noted that Maplewood is "stepping up to the plate" to address global warming with its new police building with solar power, plans for a municpal fleet of hybrid vehicles in 5 years, and the requirement that developers build green buildings in Maplewood's redevelopment zone. The Mayor estimated that if Maplewood were to receive $4 million, or just one-twentieth of its $83 million pro rata share of the war cost, "we could have our hybrid fleet now. We could have solar power in all of our municipal buildings. We could plant enough trees to cancel the greenhouse gas emissions of thousands of cars." "And the killing would stop," Profeta concluded, "More green, less death. It sounds simple. Please help make it happen." Earlier, at the National Press Club, Township Committee Member De Luca addressed a press conference to kick off the day's events. De Luca estimated Maplewood's cost of the war in Iraq at about $3,500 "for every man, woman and child in town." He said, "I am proud to stand here today with elected local and state leaders from across the country calling for an end to military operations in Iraq. It is time to bring the troops home, back to their communities, communities that we represent as elected officials." De Luca noted that what Maplewood shares "with all communities in our state and across the United States is that this war is hurting our people, taking dollars from their pockets to support national priorities that are misguided. These priorities support a war machine at the expense of human needs. In our community, like others, our citizens need affordable health care, senior citizen housing and social services, and a well funded educational system. Instead, we in Maplewood are faced with increasing costs and already crushing property taxes, necessitating 2007 budget cuts in police, fire and sanitation services and school personnel." De Luca estimated that Federal aid to Maplewood and South Orange schools is less than two percent but that "If the President and Congress met the goal of the federal Individuals with Disabilities Education Act (IDEA) -- providing 40% of the cost of educating students with disabilities -- it would mean millions more for our schools" and lessen the burden on taxpayers. "For our seniors, we sadly have to tell them that there is no funding to build affordable housing that will allow them to remain in their community as they age. There are countless other examples of how spending for this war crowds out human priorities. We are gratified to be here today representing our township in this grassroots effort to influence the federal government's misdirected foreign and domestic policies," De Luca concluded. Cities for Peace Day was organized by Washington-based Cities for Peace, a national clearinghouse of actions for peace by local and state governments. A template of South Mountain Peace Action's "Be About Peace Day" is featured on the Cities for Peace website as an example of a cooperative effort for peace between residents and local officials.